I found this article I wrote in 1981 after I had been to Egypt. It is a bit judgemental (it was 34 years ago) but I thought you might be interested. “Egypt must be at least 10,000 miles from New Zealand. I thought this as I sat at Auckland Airport waiting for my flight to Singapore. It would be the first leg of my trip to Egypt. Ten years ago I had studied, and become fascinated with, the Middle East and its history. I couldn’t wait to see it all – Arab sheiks sweeping in from the desert, camel trains stretched along distant horizons, veiled women shopping in mysterious bazaars. At Dubai I had to change airlines. The airport was all marble floors and rich velvet curtains garishly illuminated by chandeliers. There were several huge transit lounges, all of them overflowing with bodies wrapped in saris or draped in dishdashas. If I couldn’t find a seat it was going to be a very long night from 1.00am till 8.00am. At 5.00am I gave up trying to sleep and found an enormous restaurant where I had breakfast. A man came and sat at my table. He was a Presbyterian minister from Korea and very polite. The minister and I ate our breakfast looking out a large window at mile after mile of flat, featureless sand while far away, on the horizon, the sun rose, large and bright red. The sand and haze in the air makes the sun red when it first appears so the Minister explained to me. Whatever the cause, I was spellbound. Egypt Air flight 243 left Dubai for Cairo. It was my first close encounter with the Mystic East. Each man seemed to be travelling with at least 4 wives and a dozen children. The children’s faces peered at me over the back of the seat in front; little girls with pierced ears and both boys and girls dripping with jewellry. Looking out the window I could see coastline and guessed it must be Saudi Arabia. Suddenly we were circling over Cairo; I caught glimpses of square flat topped houses and domed buildings, all sand coloured. The plane landed then taxied past abandoned trucks, and tanks; when was the last war fought here? The Yom Kippur War with Israel in 1973? There were piles of rubbish but not a blade of grass or a leaf and the airport terminal itself seemed to me like a rather forlorn outpost of the British Empire. It had none of the opulence of Dubai. Guess that oil money made the difference. There was a lengthy wait for my luggage and I watched in amazement as the conveyor belts belched out enormous tin trunks, cardboard boxes tied with string, suitcases also tied with string, washing machines, stereos and electric fans. Eventually I fell, exhausted into a taxi and headed for my hotel and a cold drink. Nothing could have prepared me for Cairo and its traffic. The hotel was old but quiet and cool and I stood in my room looking out the window watching the traffic, both on the streets and the River Nile. Next morning I took a guided tour to the Pyramids at Gizah. My guide was a Norwegian archaeology student suggested by the staff at the hotel. He knew his stuff. City streets gradually gave way to suburbs of mud houses. Here water buffalo were still used to turn the wheels of an irrigation canal. Just like a picture I remembered from a history book in primary school. The canal was a busy place, donkeys and buffalo were in it, children were in it and women washed their families’ clothes in it. Despite appalling poverty the people all looked happy and I would have loved to take photos but decided to commit the scenes to memory rather than offend. From a distance the pyramids looked smaller than I had envisaged. But they seemed to grow until the Great Pyramid towered over us, completely dominating the other pyramids and surrounding countryside. I stood in awe of this majesty. Words failed me as I struggled to think of the lives lost and enormous task it must have been to build these monuments over five thousand years ago. I knew that the tombs inside had been robbed years ago of their treasures, but somehow the pyramids still exuded a living presence. Maybe it was the soft gold colour which shone through the stone or maybe it was just that they had stood sentinel on the edge of the desert for so long. People climb up the outside of the Pyramids and also clamber through tunnels inside. I just stood and stared. Tourists are beseiged by touts offering camel rides and no end of souvenirs. After looking at the Sphinx and a small museum I decided to move on and hopefully return again later in my holiday. We returned to Cairo via Memphis, the original capital of Egypt. This site had not been excavated thoroughly but the guide showed me many ruined statues of animals which had lined a long avenue leading to the stepped pyramid of Saqqarah. 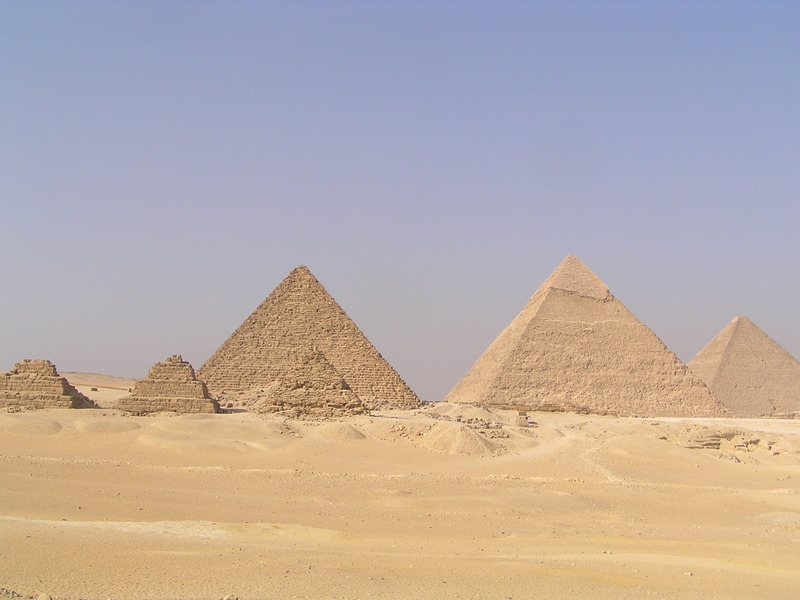 It is estimated that Saqqarah had been standing for five hundred years before work was begun on the Great Pyramid of Gizah. I shivered at the thought of five thousand years of history which had passed while this once capital city lay forgotten under the shifting sands. One hundred and fifty years of European settlement in New Zealand hardly seemed worth noting. At 4.30am next morning a battered taxi was hurtling me through pre-dawn Cairo to the airport for the domestic flight to Luxor 500 miles south up the Nile. We were not late and there wasn’t much traffic, but I suppose the habit of driving like that is pretty deep-rooted. The pace of life was much slower in Luxor and it was also much hotter. It was hard to believe it was 1981. Women in long black robes and veils glided along with plastic bags, tins or sacks on their heads. Childrens’ skiny brown legs flailed away at the sides of donkeys oblivious to the taxi driver who only just missed knocking several children into the river. The heat was intense, by midday it was 40deg. and the town closed for siesta. Late in the afternoon I could hear some activity outside and joined some of the passengers from the flight who were staying at the same hotel. We went on a shopping trip to the souk. Tiny doorways in dark alleys, scrawny cats and a hundred exotic smells were some first impressions. Dark eyes and wide smiles beckoning us to buy. Loved it all, especially haggling over the price of a leather bag which I really didn’t need but ended up with at less than half its original price. After our evening meal our group sat quietly looking across the River Nile. Some small native boats called feluccas with diagonal rigging sailed slowly passed, the water gently lapping against the wood. The sun was setting, and in the brief twilight, people walking and talking were black silhouettes against an amber sky. Gosh, I’ve just read this for the first time in years – it does go on a bit. Join Venus Adventures on a women-only trip to Egypt, just click here for more details!